After rescuing a 3-3 draw at TSG 1899 Hoffenheim to maintain coach Andre Schubert's unbeaten record since taking over, the Borussia Mönchengladbach players were a relieved bunch. Granit Xhaka (Gladbach captain): "To come back from 3-1 down away from home isn't easy and so the whole team deserve praise. We discussed a few things at the break but then we conceded straight after the restart. It certainly wasn't an easy game, particularly after playing against Sevilla in the Champions League on Wednesday, but we showed real team spirit and can be proud of our performance today. We're really pleased that we were able to continue our good run and we're already looking forward to the game against Bayern." Julian Korb (Gladbach defender): "We'll leave here today feeling positive because we showed really good team spirit. We were definitely the better team for long stretches but gave goals away too easily on the counter. Obviously, even at 3-1 down we still believed in ourselves and that we could take something from here, and we got the reward for that late on. It was a hard-fought point, but one that we'll happily take." Andre Schubert (Gladbach coach): "We started well and wanted to play in a disciplined fashion to take control early on. After we went ahead we should have held on, but we lost the ball too often going forward. We basically just invited them onto us, although Hoffenheim were very impressive and played at a really high tempo. More impressive for me though is how we came back. It was a great game and I think a point is deserved." Huub Stevens (Hoffenheim coach): "We're obviously disappointed but the passion we showed today is how we'll have to carry on. We made life tough for Gladbach and did well, although should have scored a fourth goal. It was a great game and I can only praise my boys, but a goal like they scored late on shouldn't happen. We have to learn from that and that's why we're disappointed today." 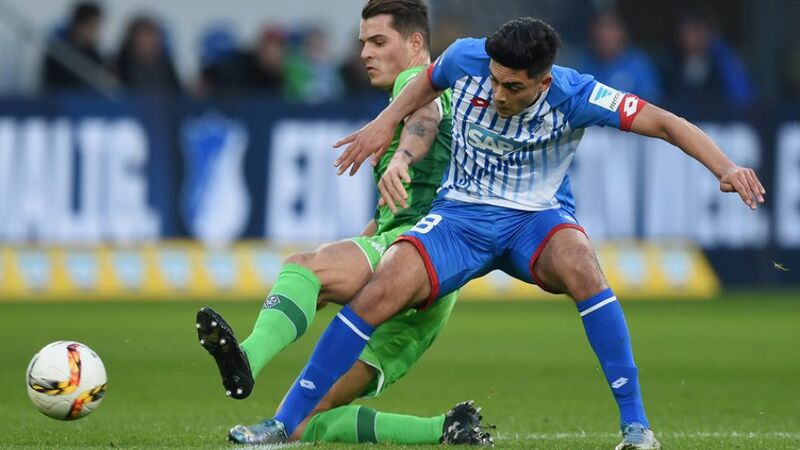 Nadiem Amiri (Hoffenheim midfielder): "It's a great feeling to score my first Bundesliga goal, although it's pretty frustrating that we weren't able to pick up our first home win of the season today. After they made it 3-3, I just fell to the ground. I couldn't believe it." Eugen Polanski (Hoffenheim midfielder): "I'm sure it was a great game for the neutral, but it wasn't for us. When you lead 3-1 at home you have to close the game out. Their second goal came at just the wrong moment and then we got hit on the counter late on."